Description: A small Doto of the coronata group, with up to 7 pairs of cerata. The cerata are club-shaped, tapering quickly to a blunt terminal tubercle. The tubercles are typically in five rows and have large, round, red pigment spots. The body is white with dense mottling of dark red pigment. The digestive gland is bright pink-red in colour. Habitat: This animal feeds on the athecate hydroid Sarsia eximia. This hydroid grows in dense masses on kelp stipes and on rock surfaces subject to strong tidal streams or wave action, mostly in the infralittoral zone and sublittoral fringe. 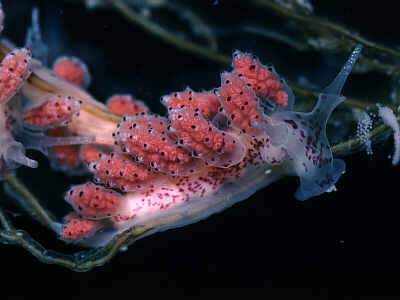 Doto sarsiae is found amongst the stems of the hydroid where it also lays its white ribbons of spawn. Distribution: Newly described from the Isle of Man in the Irish Sea, but probably not uncommon in suitable exposed habitats. Similar Species: Difficult to distinguish from other forms of Doto coronata but animals fitting this description feeding on Sarsia will probably be this species. Large red pigment spots on ceratal tubercles and on body. Cerata club-shaped, with blunt terminal tubercle. Picton, B.E. & Morrow, C.C. (2016). Doto sarsiae Morrow, Thorpe & Picton, 1992. [In] Encyclopedia of Marine Life of Britain and Ireland.